CHS congratulates Marin Transit and Golden Gate Transit on the opening of the Novato Transit Center. The $4.7 million center, which had a ribbon cutting on September 6, features a 280-foot center platform with a Brazilian Walnut wood overhang. The design features a center platform in the median of Redwood Boulevard, which allows buses from opposite directions to crisscross one another to approach and depart. CHS designed a safe pedestrian crossing and signal priority system that allows buses to enter the traffic stream safely. 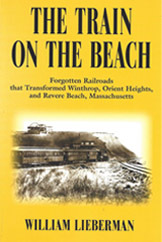 CHS Consulting Group congratulates Bill Lieberman, our Principal Transportation Planner, on the publication of his new book, The Train on the Beach: Forgotten Railroads that Transformed Winthrop, Orient Heights, and Revere Beach, Massachusetts. It tells the story of railroads in the 1870s and ‘80s serving communities northeast of his native Boston, Massachusetts. The book details the construction and operation of both narrow and standard gauge lines, and it explains how those railroads stimulated the development of this once rural area. The subject came naturally to Bill. As a teenager, he embraced railways and transit as an avocation long before they were part of his vocation. He spent the better part of the past four years compiling previous research efforts, conducting new research, and writing a text that would be of interest both to rail buffs and those interested in urban history. The Train on the Beach retails for $19.95. It can be ordered directly from the publisher, BookLocker, as well as from Amazon and Barnes & Noble. You can learn more about this publication and read some excerpts from the book here.